Six years ago, Anne Murray, an occupational therapist, visited John Andrew Boockvar, M.D., vice chair of the department of neurosurgery, and director of the Brain Tumor Center at Lenox Hill Hospital, a member of Northwell Health, the largest health care system in New York state. Murray had received a diagnosis of glioblastoma, often referred to as GBM — one of the most aggressive forms of brain cancer. In the months that followed, Murray’s tumor, which had been growing out of control, shrunk back to a manageable size. Murray now goes for regular MRIs, but doesn’t take any medication. She also works a few hours a week. She feels her positive attitude has come from the support she receives from her caregivers, friends, the community and her church, St. Rose of Lima. 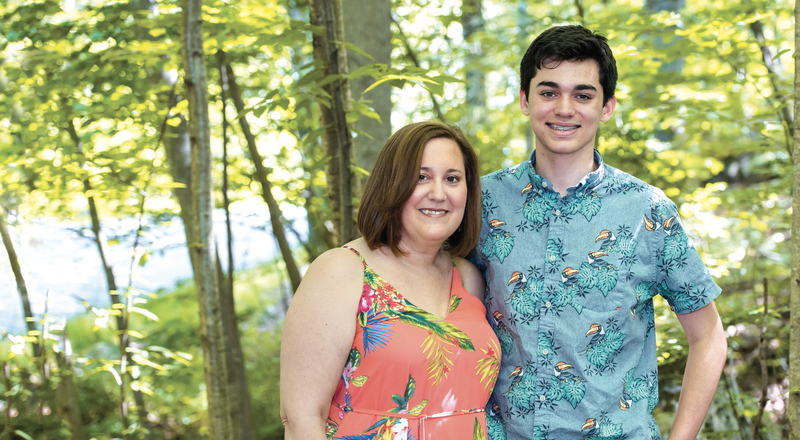 “The fact that I got to celebrate my son’s 15th birthday was such a gift,” says Murray, who lives with her son and husband in Newtown, Connecticut. “I didn’t know if I was going to be around. We do a lot of celebrating around here. GBM remains incurable, a devastating malignancy. However, Boockvar points out that 30 percent of patients will survive two years. Of those that make it to two years, half will make it to three years. And then there are the five-year survivors. A 2009 study found that as many as 10 percent might make it this far. Some live even longer: Boockvar has a patient diagnosed at 20 years old who is now nine years out, getting on with his life and going to college. Gliomas are a malignancy of the brain’s supportive tissue, or glial cells, from the Greek word for glue. Astrocytomas, a type of glioma, arise from one kind of glial cell, called astrocytes because the cells are star-shaped. GBM is the highest grade of glioma (grade 4) and is the most malignant form of astrocytoma. About two-thirds of gliomas are GBM. In the United States, approximately 12,000 new cases of GBM are diagnosed each year. As brain tumors grow, they often crowd out or interfere with normal brain structures and functions, creating symptoms such as headaches, seizures, memory loss and behavior changes. Experts say that several things make GBM particularly challenging: First, it occurs in the brain — that limits how much of a tumor can be taken out or irradiated. In addition, this malignancy grows behind the blood-brain barrier, which is a wall of specialized cells that keeps most compounds from migrating from the bloodstream into the brain. That makes it difficult to deliver drugs to GBM tumors. As if that weren’t enough, GBM tumors are diffuse, tentacle like spreading through the brain rather than concentrating in one or several places like most breast or lung tumors. And spidery GBM is always aggressive, changing and morphing to escape from immune cells and other enemies. One part of a tumor may have different genetics in different areas. Often, when these tumors recur, the genetics have completely changed, making them an entirely new adversary to the medical team. “One of the biggest challenges of this disease is that it is so heterogenous. That is, it’s so different in every patient, and not every part of the tumor is the same. You’re playing whack-a-mole, trying to kill all (of) the different kinds of GBM cells,” explains Linda Liau, M.D., Ph.D., M.B.A., director of the Brain Tumor Program at the University of California Los Angeles. One of the most profound advances has been the Food and Drug Administration’s (FDA) approval of two medications specifically for the treatment of GBM: In 2005, Temodar (temozolomide) received full FDA approval for the treatment of adult patients with newly diagnosed GBM concomitantly with radiotherapy and then as maintenance treatment. The medication works by damaging the DNA of tumor cells, leading to cell death. Then, in 2009, the FDA granted accelerated approval to Avastin for GBM that occurs after prior therapy. Last year, it received full approval. Avastin can control swelling caused by the cancer, or by treatment, thus decreasing dependence on corticosteroids that can have serious side effects. However, it has not been proved to improve survival outcomes. Meanwhile, a new era in which genetic sequencing — analyzing the genetic code of tumors — has become faster and less expensive and has led to the identification of many potential genetic and metabolic targets that might lead to breakthrough treatment. It has also made more fine-grained diagnosis possible that combines genetic information and how tumor cells look under a microscope. Doctors use both genetic sequencing and imaging techniques, such as MRI with contrast dyes to make the tumor cells stand out and CT scans to diagnose the disease and characterize it. For instance, based on genetics, GBM has been divided into two major subgroups: IDH wild-type (90 percent) and IDH-mutant (10 percent). IDH wild-type GBM tends to be more malignant, so knowing the subtype helps physicians decide how aggressively to design treatment. In addition, GBM tumors with an inactive gene called methylated MGMT, found in 50 percent of GBM cases, predicts longer survival. Genetic mutations, changes in what proteins are produced under the direction of those genes, point to other potential GBM markers. For instance, many growth factor receptors — epidermal growth factor receptor, vascular endothelial growth factor, platelet-derived growth factor receptor — are either mutated or overexpressed in GBM, thus removing the cellular brakes and allowing the tumor cells to go into overdrive. Ongoing clinical trials are now testing treatments that could inhibit these growth factors. One clinical trial is testing a DNA vaccine, INO-5401, that seeks out three markers overexpressed in GBM. Other trials are examining AG-120, an oral drug that inhibits the IDH1 mutation. “There is just a ton of research going on right now. There’s real ferment,” says Sean Grimm, M.D., codirector of the Brain Tumor Center at Northwestern Medicine Cancer Center in Warrenville, Illinois. Most experts caution that it will take time to figure out ways to design and deliver drugs that can reach those various targets, and to figure out what works. Various research groups are working on myriad ways to get around the blood-brain barrier. They are using gold nanoparticles, viruses (polio, adenoviruses or herpes virus), specially engineered genes, antibodies and stem cells, combining viruses with oral drugs. In a sense, these delivery mechanisms, or vectors, act like specialized smart bombs that can get around the brain’s defenses and deliver treatments where they need to go. Other methods in clinical trial are more mechanical: Some teams spray chemotherapy agents into the surgical site. Others leave radioactive beads or biodegradable wafers to deliver a high dose of local radiation. Convectionenhanced delivery employs a pump to slowly drip anti-tumor agents into the site. In another method, a biodegradable Gliadel wafer that cannot be removed is left in the tumor cavity after surgery to release a chemotherapy drug into the tumor tissue. In tandem with drug development, GBM surgery has been making strides. GBM cells spread like tentacles, as previously mentioned, and usually cannot be totally removed, surgeons say. Additionally, brain tumors are not always visible, nor are they always easy to access. A century ago, surgeons would remove half of a brain hemisphere in a patient with GBM in an attempt to get every last tumor cell. Eventually, surgeons found that method didn’t help: Removing that much of the brain eliminated much of the patient’s abilities and personality, and tumors still eventually grew in the remaining half of the brain. Today, neurosurgeons have to balance on a knife’s edge: They try to remove as much of the tumor as they can while avoiding damage to abilities such as movement, sensation or speech. Computerized brain mapping, much like GPS, makes it possible for surgeons to find their way more accurately. Performing MRI scans while the patient is still in the operating room (intra-operative MRI) does as well. Stereotactic computerized surgical equipment also improves accuracy. In some cases, surgeons use a local anesthetic so they can perform awake craniotomies, asking for patient feedback as they remove tissue so as to avoid too much damage. And when a tumor recurs, surgeons now can do minimally invasive, MRI-guided biopsies so that the medical team can evaluate whether this is a new tumor or tissue damage from treatment. After surgery, the standard of care in GBM is usually radiation five days a week for five or six weeks. A kind of local radiation, which more precisely targets larger doses of radiation, may be used, such as stereotactic radiosurgery, proton beam therapy or image-guided radiation therapy. Although results from earlier studies have showed no benefit to continuing radiation beyond six weeks, researchers today are looking at whether new more precise methods can increase the dose or the duration of radiation to better effect. 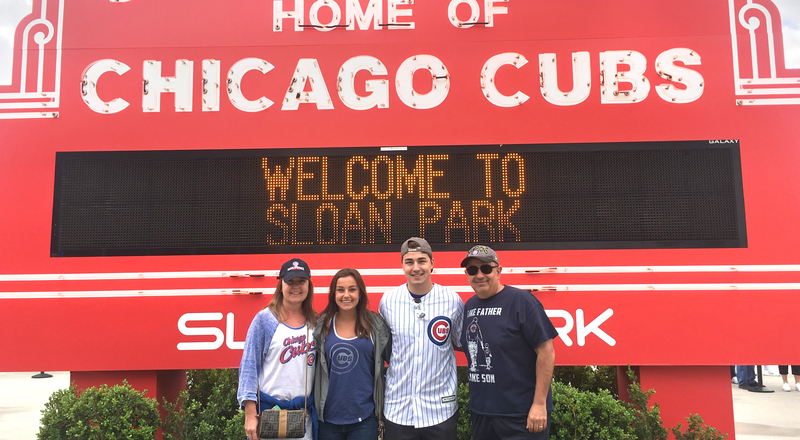 Carmen Mirandola, a sales area manager from suburban Chicago, was on a business trip to Colorado in February 2017 when he suddenly started to have strange symptoms, small seizures and tremors. Colleagues took him to the local emergency department, where a scan found a small mass in the right frontal lobe of his brain. When he returned home, a biopsy confirmed a GBM diagnosis. Mirandola’s surgeon at Northwestern Medicine Central DuPage Hospital was able to remove all of the tumor, often not possible in GBM. After that, Mirandola participated in a clinical trial in which he received proton radiation therapy and Temodar. After more than a year of treatment, he says, his medical team has told him that he may be one of those lucky patients who may survive a decade or more. Radiation causes DNA damage that leads to the death of tumor cells. Temodar enhances this. Some studies’ findings suggest that radiation doses and timelines can increase as much as 30 percent and improve GBM survival post Temodar. When the timing of radiation and Temodar doses are coordinated, early results from the ongoing CATNON study also showed benefit. Other teams are investigating whether radiation or proton therapy can be used when a GBM tumor recurs. The FDA has also approved electric field therapy for GBM: Optune is a wearable device that delivers continuous electric pulses to the tumor, through adhesive patches — transducer arrays — applied to the scalp and connected to the device and a battery. The Optune device must be worn for at least 18 hours a day. Although FDA approved, Optune remains controversial among neuroscientists. Some sharply criticize the lack of a sham device to the clinical trials that led to its approval. Others say they’re concerned that it remains unclear what biological mechanism makes the treatment work. “Although trials show some efficacy, most feel that the impact is not dramatic enough that it will become a mainstay of brain tumor therapy,” explains Theodore Schwartz, M.D., professor of minimally invasive neurosurgery at Weill Cornell Medicine in Manhattan. Further out on the research edge, GBM investigators are trying to determine if an exciting new area of cancer research, immunotherapy, may work for these aggressive brain tumors. Cancer vaccines attack GBM cells by using genetically engineered cells to stimulate the immune system and cause a response. Some teams are looking at chimeric antigen receptor T-cell therapy, which re-engineers a patient’s own immune cells so that they target specific receptors on tumor cells. Other trials are looking at checkpoint inhibitors, which block normal protective proteins on cancer cells, allowing the immune system to target them. So far, trials with checkpoint inhibitors haven’t seemed to make a difference in GBM, but experts say there’s still work to be done here and with Optune.